The Fredrik Dining Table has a lot going for it, and there's so much more than what meets the eye. On the surface, this is a strikingly stylish Scandinavian inspired design defined by sleek angles and simple form. Its good looks can be attributed to its award-winning designer, Lino Codato of Italy. But what truly makes the Fredrik Dining Table shine are the details that Mr. Codato included under the scratch, burn and stain-resistant surface. The Fredrik's top is actually constructed of an engineered wood (with solid American Ash wood inlays) with an applied powder-coating that is not only visually beautiful but that which has been cured to seal out chemicals and bacteria. Combined with its unwavering durability in heavy-use dining areas, the top is environment-safe, while the legs are environment-friendly (constructed of FSC-certified solid American Ash wood). I wanted something both extremely durable and attractive, I got both with this table! Not using as a dining table but using as a group study table, it's working out excellently! ANGLED LEGS & PROTRUDING TABLE EDGES <33 BEAUTIFUL DESIGN!! SOO DIFFERENT without being too eccentric or odd looking!! Haven't seen anything like it out there AND love all the features ensuring it will last a long time especially because I really like the way it looks in my dining room! Best table i've ever had, needed a little more space for it in my dining room but love it! By far my favorite table, i wanted to go greener with my purchases and this was a great choice! Looks beautiful in my dining room and well-made! I am so impressed by this design! I wanted something to prevent scratching on the surface, I have a toddler and teenagers so needless to say the last table had a few bumps and scratches. This design is super modern and looks wonderful in my dining room! The contrast of white and wood is my favorite part. It is built very well and we use it everyday. ProsGreat quality and can't beat the price. does anyone know the chairs that are pictured with this table? Can the white top be wiped with a damp cloth if some should spill on it? How durable is it? I have little grandchildren. Thanks. The white top of the Eco-Natura Fredrik Dining Table can be cleaned by using a mild soap and damp cloth. The table top is also burn, stain & scratch resistant. 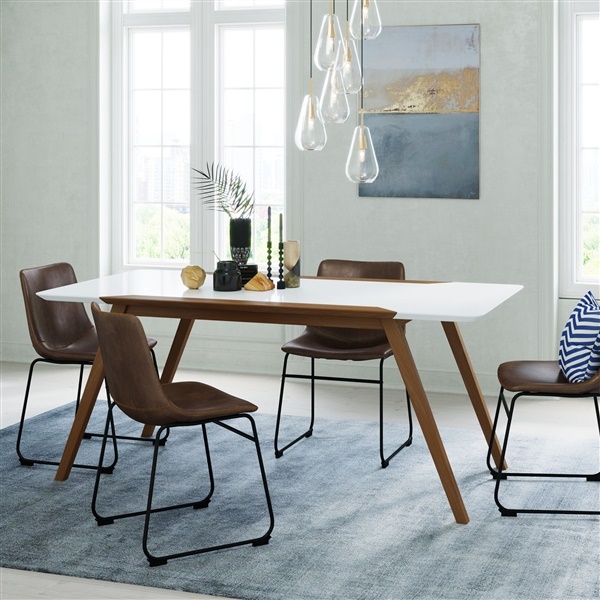 Regarding the Eco-Natura Fredrik dining table for $749, how many people does this table seat and are there chairs specifically for it? Thank you. Is there any way to get this table in a slightly smaller size...ie: 63-66" long by 31.5" wide? The Eco-Natura Fredrik Dining Table is only available in the size shown on the product listing. Width: 71" Depth: 35.5" Height: 29.75"
Hello, What is the distance between the legs (both length and with). I want to make sure my chairs will fit underneath. For this dining table, on the long side, the legs have 62.5" of space measuring from the bottom and the short side has 32" of space between the legs. Is the table top pure white or off white? The table top is considered to be a pure white. Is there any groove between the mdf and the wood on top? The Eco-Natura Fredrik Dining Table has a hairline groove between the MDF top and the decorative wood element.